This product is Cheapest price, available for sale from China without tax go through During 2018's Christmas day, Purchase from China Electronics wholesaler: www.saleholy.com My Blog: http://www.wholesalechinaphone.com Feature 7.2-inch OLED waterdrop notch screen, FHD+ 2244x1080p, 18.7:9 ratio, 346 PPI. Kirin 980 Soc Octa-core 2.6 GHz, the world's first 7nm chipset, Mali G76 720MHz GPU and GPU Turbo 2.0. with 6GB/8GB RAM, 128GB/256GB storage. 40MP+20MP+ 8MP rear triple-camera, with Leica certification, a 24 MP front camera. 5000mAh battery, 4.5V/5A Super Charge 22.5W supported EMUI 9 base on Android Pie 9.0 OS. EMUI 9 base on Android 9.0 Pie OS Offers a fresh, fast platform to help you stay connected and productive while you're on the go. Multi-language Supported Offers more than 30 languages to world's user: English, German, Spanish, Portuguese, French, Italian, Russian, Arabic, and more. Compatible with Global 4G LTE Bands This phone offers global 4G LTE-FDD:B1/B2/B3/B4/B5/B6/B7/B8/B9/B12/B17/B18/B19/B20/B26. 4G LTE Speed Provides fast Web connection for downloading apps, streaming content and staying connected with social media. Hisilicon Kirin 980 Processor with 6GB/8GB of RAM Hisilicon Kirin 980 octa-core processor and 6GB/8GB of RAM deliver outstanding overall performance for opening and running applications, flipping through menus, running home screens and more. 128GB/256GB Internal Memory Provides plenty of storage space for your contacts, music, photos, apps and more. Expand storage up to 256GB by adding NM card (uses SIM 2, sold separately). World’s 1st 7nm Mobile AI Chipset The industry-leading 7nm process technology of Kirin 980 generates direct performance upgrade of speed improvement and power efficiency. By adopting the advanced and flexible CPU and GPU multi-core architecture, task and operation speed of the device have been greatly increased. One of the DUAL-NPU offers vast AI computing and the other focuses on specific tasks to create massive efficiencies and a drastically improved user experience. Unleash the Joy of Gaming Powered by GPU Turbo 2.0 technology, hardware and software work hand-in-hand to accelerate speed and power for a breakthrough gaming experience. The HUAWEI Mate 20 X supports faster, smoother, more stable gaming even in complex, graphically intensive games. The device uses Huawei Supercool – a cooling technology which consists of a vapor chamber and a graphene film cooling technology. 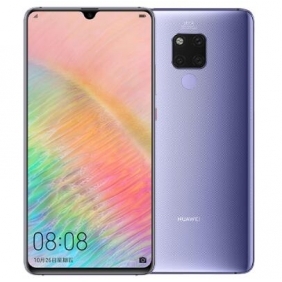 7.2" OLED Waterdrop Notch FHD+ Screen The Huawei Mate 20 X packs in a huge 7.2-inch OLED, HDR display, it has a Full HD+ (2244 x 1080) resolution with a 87.83% screen to body ration, making it bigger, and boasting a higher resolution, than the Nintendo Switch. 40MP+20MP+ 8MP Rear Triple-Camera with Leica Certification The new Leica Triple Camera powered by AI reveals life’s drama, texture, colour and beauty in every photograph that will take your breath away. Designed for different scenarios, the 40 MP main RGB lens captures great details in everyday photos, while the 8 MP telephoto lens will focus on your distant shots and the whole new 20 MP Leica Ultra Wide Angle Lens is perfect for the landscape photos and macro shots. Also includes a front-facing 24 MP camera for self-portraits and video. AI-Painting Photography Recognising more than 1500 scenarios and 25 categories, the upgraded AI-powered photography now can segment different objects and scenes in one photo. Colours, brightness and contrast are adjusted automatically and precisely, just like fine-painting a photo, with perfect balance.